Rumors may be the oldest medium of mass communication of information or ideas. Even before there were newspapers, radio, or television, rumors communicated by word-of-mouth made and shattered reputations, and set off riots and wars. Yet contrary to predictions, rumors continue to thrive, in spite of and parallel to mass media. What accounts for the puzzling persistence and continuing significance of this little-studied social phenomenon? Jean-No;el Kapferer examines the theory and practice of rumors, focusing on specific areas such as entertainment, criminal behavior, business and finance, and politics. He describes the kinds of conditions that give birth to rumors, why we believe them, and the hidden messages they convey. Kapferer points out that rumors frequently serve useful social purposes and present rich examples. He speculates about how rumors can be controlled, changed, and prevented. 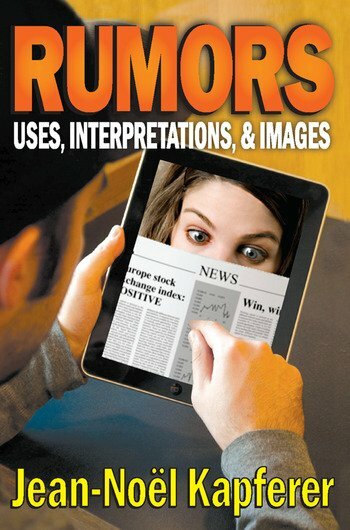 Drawing upon contributions of disciplines ranging from psychology to history, and integrating the insights of Europeans with the latest work of American researchers, this is the most comprehensive examination of rumors, gossip, and urban legends yet published. Translated into nine languages, this edition was updated with advances in theory and research since the book's original French publication in 1987. Its brisk, accessible style makes the book of interest to psychologists, economists, political scientists, sociologists, and folklore analysts, as well as the general reader who is curious about the origins of this fascinating social phenomenon.